I'm catching up on email and found a comment about the cover for Flash: The Fastest Man Alive #13. 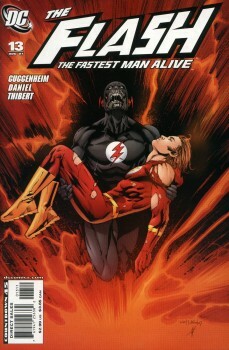 The main cover design featured the Black Flash carrying Bart's body. To avoid spoiling the conclusion, when DC solicited the book they blacked out Bart's body and the Black Flash's face, and colored the costume red so it just looked like the Flash. Standard practice for hiding cover spoilers, basically. When the issue actually hit, DC decided they liked the spoiler-warning version, and printed both versions of the artwork. From what I recall, the full-reveal cover was the main one, and the blacked-out cover was the variant. The email I got, and Mile High Comics, say the opposite. I'd like to correct my cover variants page if I've got it wrong, but I'd like to have something more solid to go on. So, does anyone have a reference to a solicitation, or shipping info, or something that indicates the ratio of one cover to the other? Was it just 50/50, or was one of them shipped as the "standard" cover, and which one? Sooner or later, you realize that Lucy is never going to let you kick the damn football. I have nothing to back it up with but I believe it was a 50/50 split. Looking to trade my single issues for the trade paperbacks. Inbox me if interested. Green Lantern, JSA, Avengers and many DC & Marvel books. As for which issue is considered the variant, I would have to say the cover with the Black Flash holding Bart. The cover with the costume and the face blackedout is the regular cover. Mycomicshop.com seems to confirm this on the Contents tab for the issue. 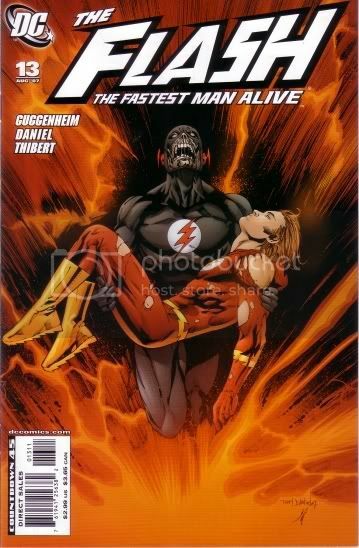 Cover A was the Empty Suit and Cover B was the Black Flash (Link:http://www.mycomicshop.com/search?q=...pubid=&PubRng=). Cover A is the regular cover and Cover B is the variant. 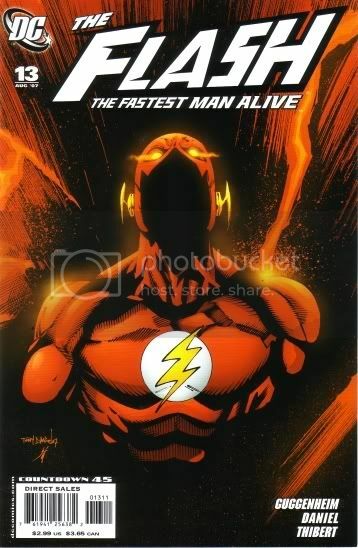 For example, look at the latest issue of The Flash#8 on their site and it has Cover A listed as the regular cover and Cover B as th variant (Link:http://www.mycomicshop.com/search?q=...pubid=&PubRng=. Midtown comics shows it the same way for The Flash#8 (Link:http://www.midtowncomics.com/store/s...ash+Vol+3+%238). Thanks for the links. The original solicitation tracks with what I remember: it was a standard spoiler-hiding altered cover (like the Flash:Rebirth #4 with the Black Flash instead of Professor Zoom), and there's no mention of planned variants. (Usually they'll list "cover by X, variant cover by Y" and add the note to retailers, as can be seen on the JLA #10 listing there). That MyComicShop link shows the one with the Black Flash and Bart as Cover A, and the blanked-out cover as Cover B - which would imply that the full cover is the main and the spoiler-warning cover is the variant, which (IMO) makes the most sense, unless it's a 50/50 split. So now we have conflicting information at MyComicShop and Mile High. It just seems weird that DC would use the version where they covered up most of the artwork with black ink as the primary cover, which is why I'm trying to find a more definite source. I can tell you it WAS a 50/50 split. Everyone is correct. This was a 50/50 split. The way to tell a variant is by the ISBN. DC Comics is identified by "61941" then is the unique series number, in this case Flash: Fastest Man Alive is "25638", and finally is the issue number. Standard issue will read a three digit issue number and then a "11"
So in this case, F: FMA #1 is 00111, #2 is 00211 and so on. If there is a reprint, the last digit is changed. So if F: FMA #1 was reprinted it would be 00112, and if there is another reprint, it would be 00113. For VARIANTS, the second to last number is changed. So you'll notice that the variant for issue #1 is 00121. As you can see below, both of these issues end in "01311", meaning neither is a variant. Thank you TitansFan. I noticed an interesting tidbit though. 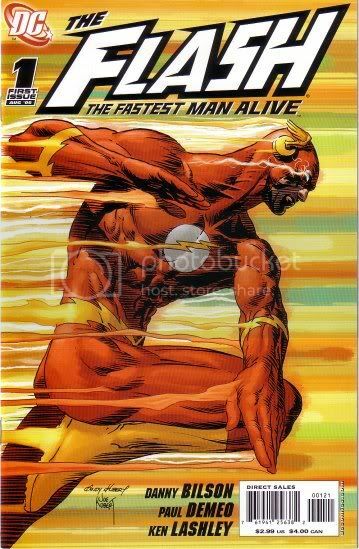 According to THE FLASH: THE FASTEST MAN ALIVE — FULL THROTTLE TPB, The Black Flash cover is the alternate cover (On the strip across the top of the page for the cover it says, "THE FLASH: THE FASTEST MAN ALIVE#13 ALTERNATE COVER BY TONY DANIEL"). Well, technically, it is an alternate cover (they both are alternates). Just not released as a variant. Thank you! I'll update my list to describe it as a 50/50 split, rather than a standard and variant.